Sto Werkstatt in London which has been a resource for architects and builders the past 5 years, is taking their show on the road with pop-up exhibitions, speaker events and other forums for industry leaders. What are the next generation of architects and designers thinking these days? Stay tuned and look for an upcoming Werkstatt program in your virtual neighborhood. After five successful years of hosting events at the Sto Werkstatt studio and materials library at Clerkenwell in London, the company has closed its studio and is taking its programs on the road. 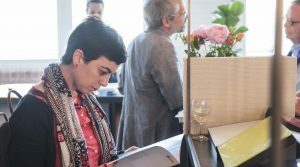 Starting earlier this year, they launched a new “nomadic” program of exhibitions, talks, project consultations along with their Sto Materials sample service. The first such program of “Sto Werkstatt Presents” was in July of this year in London, with David Thulstrup, a Danish master in the composition of material, color and form, and Ellie Stathaki, Architecture Editor of Wallpaper* discussing “Designing for Wellness & Wonder”. This first pop-up speaker program organized by Sto Werkstatt revolved around an earlier exhibition in Milan at Salone del Mobile where Sto showcased their StoSilent acoustical panel system. Thulstrup discussed how the sensual qualities of materials and design can contribute to comfort and livability within the built environment as demonstrated at the Milan salon. These Sto pop-up installations in the U.K. will continue to be a valuable resource for architects and the building industry, providing inspiration and knowledge. The rest of us will be able to tap these global trends online. The goal for Sto is to work closely with design professionals — offering specifications, details and advice that is tailored to a project’s geographical location and environmental requirements. Sto Werkstatt in London is currently showcasing an exhibit featuring StoVentec glass that was created by the innovative design firm Space Popular. Werkstatt – which means workshop in German – is a showcase and test center in London for Sto’s innovative facade and interior materials. In addition to the workshop’s extensive resource library, the center offers technical consultations, exhibitions, speakers and seminars. The current exhibit, “The Glass Chain”, is by Space Popular, a Bangkok-based multidisciplinary design and research practice led by Lara Lesmes & Fredrik Hellberg. The exhibit, which will run until December 14, features StoVentec Glass that can be used as an external rain screen cladding system, and as an interior decorative option. In their UK debut at Werkstatt, Space Popular has redefined the potential of the material with its colorful and energizing installation, which encourages the imaginative use of glass in building design. The title “The Glass Chain” is a reference to the infamous exchange of letters by a group of German architects from 1919-1920 initiated by Bruno Taut, who fantasized about the vast possibilities of an incredible new construction material: glass. He believed that all architecture, and even furniture, could be made of glass. His vision of the material was never realized, and glass simply became a solution for windows and walls. Now, almost 100 years later, Space Popular – inspired by Taut’s vision — is taking glass applications to a new level. Working with Sto technical experts, they have created a kaleidoscopic glass construction that explores different ranges of scale, playing with our visual perception of glass doorways as grand arches and small steps as giant pediments. Curated exhibitions such as this at Sto Werkstatt are an opportunity to explore the changing nature of collaboration, between architects, materials manufacturers and applicators. Materials on display include glass and rendered rain screen cladding, seamless acoustics, facade elements and intelligent interior and exterior paint coatings. 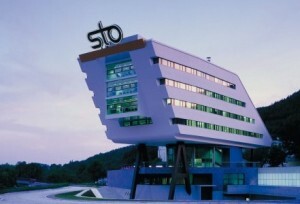 Sto's headquarters in Germany symbolizes the company's dedication to innovation, energy efficiency and the building technologies of tomorrow. The global giant now called Sto evolved from humble beginnings as a cement and lime factory in Weizen, Germany in the 1830s. More than a century later, entrepreneur William Stotmeister expanded on this operation by introducing a range of revolutionary resin wall coatings, and Sto ultimately evolved into an international technology leader in the design and production of innovative external wall insulation systems, rainscreen cladding, decorative coatings and acoustic systems for regulating room noise. Now operating as STO SE & Co KGaA, in Stuhlingen, Germany, the parent company launched operations in the U.S in 1979, establishing Sto Energy Conservation in Vermont. In 1986, North American expansion continued in California and Texas and eventually into Canada. In 1987, in order to centralize operations and accommodate unprecedented sales volume, Sto Corp. North American headquarters were moved to Atlanta — also the site of a major new manufacturing facility. In 2014, the company launched operations in Brazil and Chile. Today, Sto Group is the world’s largest manufacturer of exterior thermal insulation systems, encompassing 35 subsidiaries, more than 5000 employees, and 21 factories operating around the globe. The company has consistently been on the technological leading edge, investing heavily in scientific research and product development. This has resulted in a stream of innovations, including the introduction of the first exterior wall cladding system offering continuous insulation in 1963, and product breakthroughs such as the first liquid-applied air moisture barrier (2000) and Sto’s patented StoCoat® Lotusan® coating with self-cleaning properties (2005). The company focuses on supporting the needs of the architecture and design community with educational services such as its London-based Werkstatt exhibition space, AIA/CES professional courses and the aesthetic consulting services provided by Sto Studio in the U.S.
For over 60 years, Sto — still controlled by the Stotmeister family — has continuing to develop innovative, next-generation building and design solutions based on superior product performance, professional expertise and success in building strong relationships through knowledgeable, customized service. Sto wall systems, coatings and finishes continue to be the choice of leading architects, designers, engineers, contractors and building owners around the world. Sam Jacob Studio created an installation based on the humble shed. For London’s Clerkenwell Design Week this year, Sto Werkstatt (Workshop) invited Sam Jacob Studio to create a unique innovative installation at the Werkstatt’s gallery space. Jacob’s One Thing After Another became a project that explores the inputs and outputs of information between the digital and physical worlds. The installation started with an ‘original’ piece of architecture – a garden shed. This was then 3D scanned to create a digital copy, which was then processed and scaled to fabricate a new CNC’d version from Sto’s lightweight construction material called Verolith, made of 90% perlite, a type of volcanic stone. One Thing After Another argues for an understanding of the possibilities of digital production that go beyond the blandly futuristic. Instead it suggests that new technologies can open up a wide array of design possibilities. What are consumers looking for in luxury hotel design?